The message of good oral hygiene is crucial to the health of each and every individual—and of the nation as a whole—considering that tooth decay ranks as the second most-common health condition falling just below the common cold. Tooth decay is a highly preventable condition, yet more than 40 percent of children are affected by cavities in their primary teeth and 66 percent of teens suffer from tooth decay in at least one permanent tooth. The American Dental Association (ADA) offers year-round programs to help parents teach their children, of all ages, about the importance of good dental care. A program dedicated to the awareness of children’s dental health began in Akron, Ohio in 1941 as a one-day event. Forty years later, the ADA began sponsoring the event and made it a month-long campaign, known as National Children’s Dental Health Month (NCDHM), which helps dental professionals, teachers, and community leaders promote oral health awareness for children. February is the month of focus for NCDHM, but events and programs are held all year long to teach children the importance of good dental care. These programs help teach children about the importance of proper dental care and make it a fun lesson all year long. One of the programs, “Give Kids a Smile Day,” was started by the ADA in 2003 as a way for dentists and other dental care professionals to give their time and services to underprivileged kids in their communities. Thanks to more than 15,000 events across the nation and the help of 40,000 volunteers, the program reaches more than 450,000 children each year. Even before their first tooth has emerged, you can start teaching basic dental care to your children. It begins with familiarizing your child with daily dental care. For infants, just wipe their gums with a soft cloth after feeding. As your child grows, wrap a soft cloth around your finger, and emulate brushing your child’s gums after meals and before bed. When your child has four or more teeth, you can help them pick out their first toothbrush and toothpaste, and teach them how to brush properly. When your child has two teeth side-by-side, you can familiarize them with the habit of daily flossing by running a floss pick gently between the two teeth. Make your children a part of the experience to keep them excited about their dental care routine. Let your child to select their first toothbrush, making certain they choose a child’s soft-bristled toothbrush. Most children look forward to brushing with a toothbrush that is their favorite color or adorned with their favorite character. 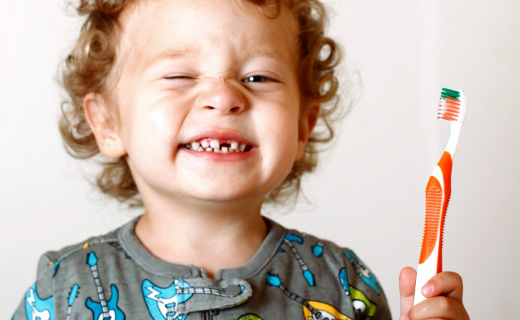 Many toothpaste brands offer flavors kids love, further enhancing the brushing experience. And don’t forget to make twice-a-year visits to your family dentist in Peoria as part of the dental care routine. Staff is wonderful and service was excellent!